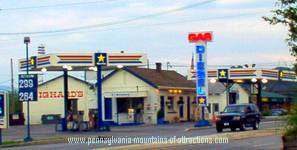 America's Oldest Gasoline Station is located in Altoona, PA. It has been in operation since 1909, and it still offers a full service rarely seen today. It has been a popular but strange Pennsylvania Historical Site. Their sign alone is a typical roadside American PA Attraction. Can you remember the good old days when you actually went to your favorite gas station and got your gas pumped and your windows washed every time you bought gas? Do you recall when car safety was a top priority when you stopped at your local gas station? At Reighard's Gas Station they don't even have a Self-Serve Gasoline Island. Every time you buy gas you not only get your gas pumped, you will enjoy getting your front and back windows washed, and if you need oil, or any kind of fluids they will check it at your request and add the fluids for you. How many places can you think of off hand that will offer that kind of service? Oh, by the way, if you take the time to compare gas station prices you'll find the gas is usually a few cents cheaper than anywhere else in Altoona! The last time I pulled into America's Oldest Gasoline Station while the attendant was pumping the gas and washing my windows he noticed my back tire seemed low. He quickly grabbed the air compressor and tire gage and checked all my tires and put air in each one. Even though I've been buying my gas at Reighard's as long as I can remember, I still can't help being impressed with the service. I absolutely hate pumping my own gas, and I would have never thought of checking the air pressure in my tires. One back tire was actually dangerously low. I was so grateful the attendent noticed. So I am not only buying my gas at a Pennsylvania Historical site, America's Oldest Gasoline Station keeps me safe! The building of this Pennsylvania Historical Site also has historical significance in Blair County and in Pennsylvania History. The unique construction is traditional in the early 1900s. The exterior walls are made of cinder blocks, a byproduct of the steam engine era. Which connects that era with Altoona, famous for the Pennsylvania Railroad, The Railroaders Memorial Museum and Altoona's World Famous Horseshoe Curve. Even the roof is made from hardened concrete shingles. You can still see the railroad tracks that run behind the station. At that time the gasoline was delivered by rail car. The Elias Baker family once owned the Pennsylvania Historical Site, Reighard's Gasoline Station was built on. Historical Baker Mansion and Baker's Allegheny Furnace is located nearby. The building was originally established as a Blacksmith Shop, and probably sold just kerosene at that time in Pennsylvania History. I'm sure nobody ever realized the site would actually someday be known as an Pennsylvania Historical Site and "America's Oldest Gasoline Station". George Reighard purchased the site between 1909 and 1921. The business was passed down through the family until 1978. Martin Oil Company bought the business in 1978 and has kept it in operation since. American's Oldest Gas Station, Baker's Mansion, and Baker's Allegheny Furnace are, without a doubt, Pennsylvania Historical Sites. The next time you're in the area check out a few of Altoona, PA Attractions, and while you're there why not get your tank filled up and your windows washed. The unique service just might keep you safe!